A modernised and well presented Victorian terraced house in the centre of the village built in 1872. On the ground floor, there is a sitting room with fireplace fitted with wood burning stove with a real wood floor and windows to two aspects. Well fitted kitchen with new door to outside and downstairs bathroom. On the first floor, the cottage has a generous master bedroom and further double bedroom. To the rear, there is a small decked courtyard and a pathway leading to a good sized garden with lawn, patio and barbecue area with a new timber shed and new fencing to the end of the lawned garden. 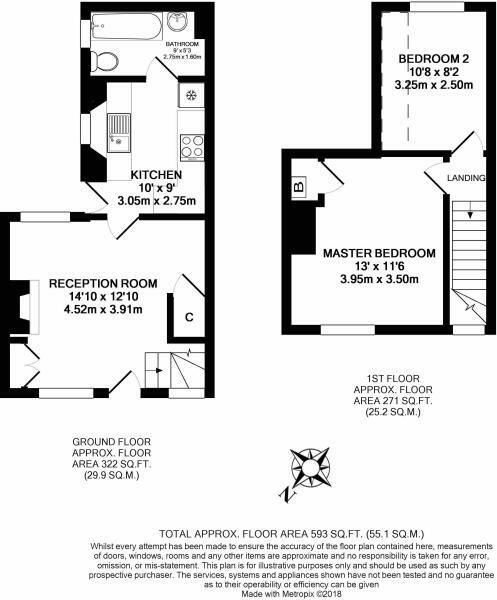 Disclaimer - Property reference 2341_EAF_6447. The information displayed about this property comprises a property advertisement. Rightmove.co.uk makes no warranty as to the accuracy or completeness of the advertisement or any linked or associated information, and Rightmove has no control over the content. This property advertisement does not constitute property particulars. The information is provided and maintained by 99home.co.uk, Covering Nationwide . Please contact the selling agent or developer directly to obtain any information which may be available under the terms of The Energy Performance of Buildings (Certificates and Inspections) (England and Wales) Regulations 2007 or the Home Report if in relation to a residential property in Scotland.